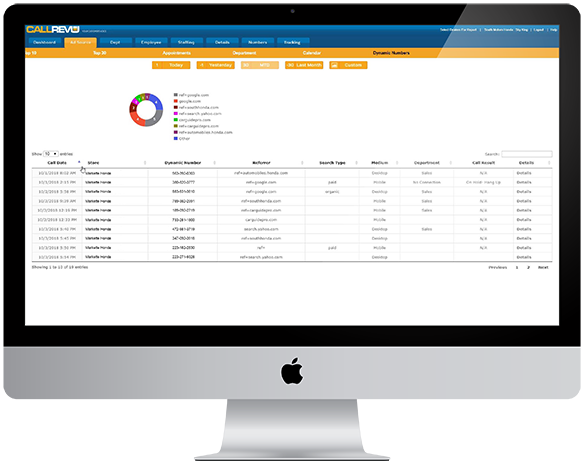 Monitor your dealership's phone calls anywhere. Track your digital ROI with unprecedented accuracy. CallRevu’s dynamic numbers deliver full visibility on your digital campaigns and search terms. Know the exact path of your customers from the click to the call. Every individual consumer accessing your digital media is served a unique toll-free number dynamically for full visibility into the digital path before and after the phone call. Dynamic number technology establishes a one-to-one correlation between the customer and a toll-free number so your dealership can track the motivation and needs of each visitor with pinpoint accuracy. Each toll-free number is directly tied to an individual who accesses the web page which means you can attribute that appointment, or sale, to its correct and original lead source. Use the power of that information when allocating advertising budgets and you're achieving maximum ROI!